New Brunswick Premier Brian Gallant speaks to reporters in front of the provincial legislature in Fredericton, Sept. 26, 2018. A set of shaky political alliances began to take shape in postelection New Brunswick Wednesday as the province’s two main parties continued to jockey for a position that will give them the upper hand in the legislature. 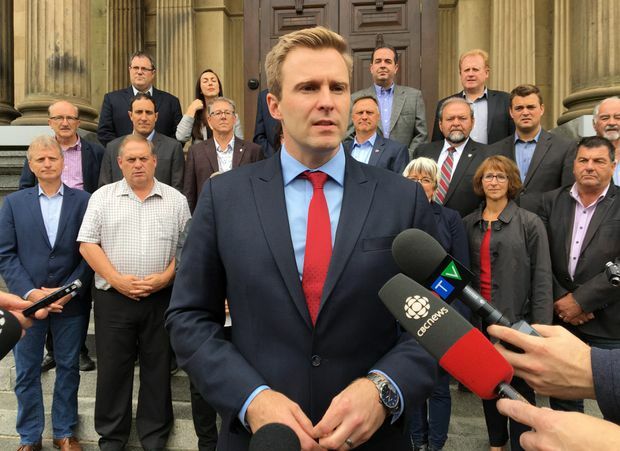 Flanked by his new caucus members at a late afternoon news conference, Liberal Premier Brian Gallant announced his party’s decision to approach the Green Party in hopes of forming some sort of co-operative alliance. Meanwhile, Kris Austin, leader of the populist People’s Alliance, acknowledged his party’s policy overlap with the Progressive Conservatives but said he was open to talking deals with any party in pursuit of stable government. “We’ll work with other parties to see that the government has stability,” Mr. Austin said. “Minority governments are all about compromise … and we’re certainly willing to do that. What I’m convinced of is New Brunswickers don’t want to be thrust into another election." New Brunswick voters elected a minority government for the first time in a century on Monday, with the incumbent Liberals winning 21 seats and the Progressive Conservatives 22. With 25 seats required for a majority in the legislature – and to pass legislation – the balance of power is held by the Green Party and the People’s Alliance (P.A. ), each of which won three seats. The two main parties must now court their support to form an alliance to govern. Mr. Austin’s P.A. party was formed just eight years ago and caused controversy during the election campaign for its language platform, which was built around eliminating language duality in N.B.’s bilingual government services. (The policy of duality allows for separate but parallel services for things such as schools and hospitals.) After spending a day removed from the public postelection discourse for what he called “internal discussion,” Mr. Austin said Wednesday that he is “working on discussions” with both the Liberal and Progressive Conservative parties. An alliance with just one of the smaller parties, though, is unlikely to be enough to give the Liberals or PCs the upper hand in the legislature. The reason is that is one party will have to give up a vote when they appoint a Speaker, who by convention does not participate in debates and only votes in cases of a tie. “Presumably the Speaker is going to come from the Liberals or the Conservatives. And who wants to give up that key vote? No one is going to be rushing for the position,” said Donald Wright, a professor of political science at the University of New Brunswick. Party leaders have some difficult decisions ahead as they negotiate with one another. Blaine Higgs’s PCs and Mr. Austin’s P.A. have each said they are prepared to work with all parties. Mr. Wright, the political scientist, said aligning with the P.A. is a tricky prospect for both of the dominant parties. Francophone New Brunswickers in the province’s northern regions have formed a key part of the Liberals’ base. Mr. Gallant, who hails from Acadian and Dutch roots, is fluently bilingual. Mr. Austin, who said his party is about “efficient and effective government services,” does not appear to be prepared to set his party’s language-related promises aside. The prospect of striking a deal with the P.A. is also tricky for Mr. Higgs’s PCs. He was criticized for his limited command of French during the campaign, which saw the cancellation of one French language debate after Mr. Higgs said he could not take part in it. Mr. Higgs also found himself having to explain to voters his previous involvement with the Confederation of Regions party, which wanted to repeal bilingualism.